Suffice it to say, that I would be remiss if I didn’t post something wonderful for your French Dip Sandwiches! I have always wanted to try making them. They look so tasty with their lovely orange color. I was not disappointed! I made a very EASY, two ingredient sauce to go with them. I couldn’t get enough of that sauce. YUM. Some of my children wanted to drink it. One of my kids said it was “Just OK, Mom”. No harm done. All the more sauce and fries for those of us who appreciate fine flavor. 2. Cut them into sticks and put them in a large bowl. It’s important that the sticks are about the same size so they cook evenly. Don’t get a ruler out or anything guys….just eye ball it. 3. Drizzle your olive oil over the top of the yams. Get your hands in the bowl and coat the beautiful yams with the oil. 4. Mix the Montreal Steak Seasoning and the Johnny’s Season Salt together in a small bowl. 5. Pour it over the top of the yams. Mix it well so that all the fries have oil and seasoning on them. 6. Spray two large cookie sheets with cooking spray and lay the fries out on to the sheets. They shouldn’t touch each other, now. You want them to keep their distance so each has the opportunity to get nice and golden-ish color. Orange-ish, golden is what I really meant to say. Trust me….you want the orange-ish golden. It’s a good thing. 7. Bake at 400 degrees for about 8 minutes. Take the pans out of the oven. With a spatula or fork turn all of the fries over so they have a chance to cook on the other side. Return the pans to the oven and cook for 8 more minutes, or until soft on the inside. Serve hot with THE SAUCE. 1. 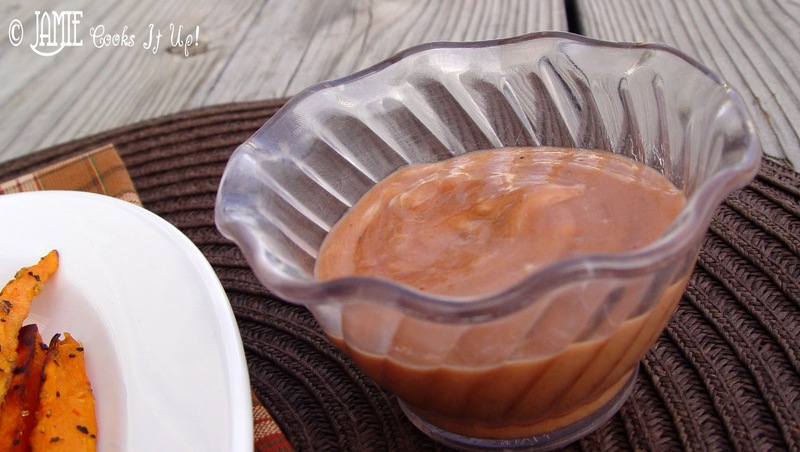 Mix the sauce ingredients together well with a spoon. Wow. That was so easy. I love it when things are super easy…especially when they are super yummy. Makes my day, actually. Hope it makes yours! Oh my… I love sweet potato fries! I'll definitely have to try this recipe. Yum! These look so delicious. Perfect side dish for any sandwich or for snacking on. 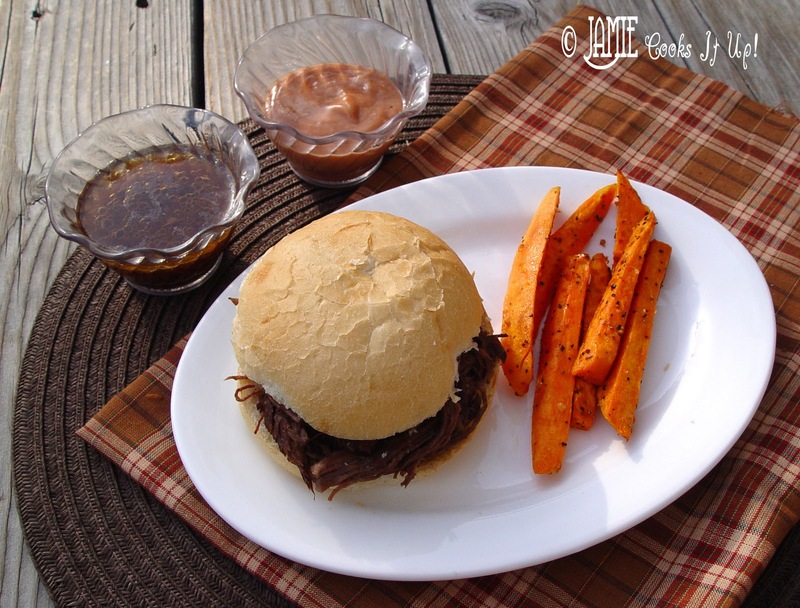 Plus, that barbecue dipping sauce sounds like it would really complement the fries well. 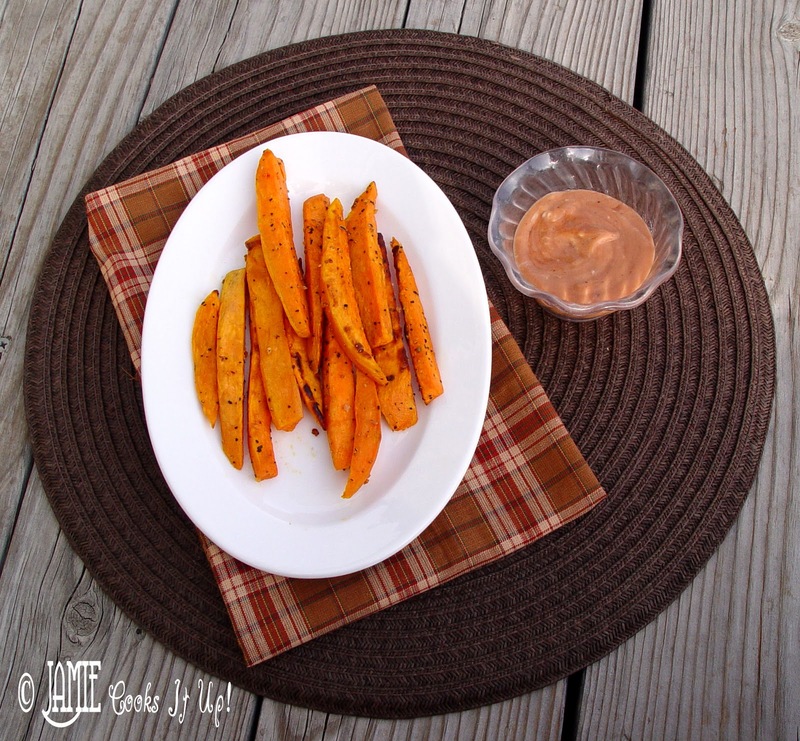 Sweet potato fries are perfect with beef and b-b-que sauce, YUM! I've always wanted to try these too. Your seasonings and dip sound just like you said, scrum diddle umptious! 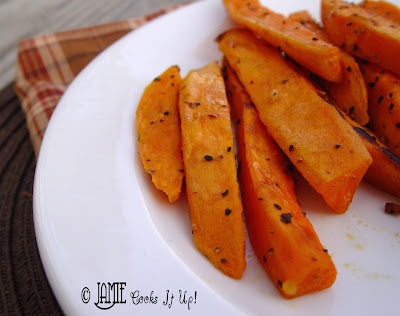 I have never made Sweet Potatoes fries, I am going to make them this week with grilled hamburgers. Just discovered your site. Printed off several recipes to try but will have to cut them way down for just me. About Baked Sweet Potato Fries–found a hint that said to place the potato sticks on a rack over your baking sheet(I used my cooling rack) and they will get crispy without turning them. I tried a batch and they came out great–crispy on the outside and tender inside. you are correct, however “yam fries” just don’t sound very appealing!